In June, Brandon Crawford was an NL MVP candidate. Since then, the shortstop has been in a free fall. After posting a season-high batting average and OPS of .338 and .921 respectively on June 10th (H/T Henry Schulman), Crawford has posted a .190 average and .555 OPS in the 78 games since. As of September 19, his 2018 numbers have fallen back to around his career averages (.255 batting average, .717 OPS) leading many to wonder what exactly happened during the season’s second half. 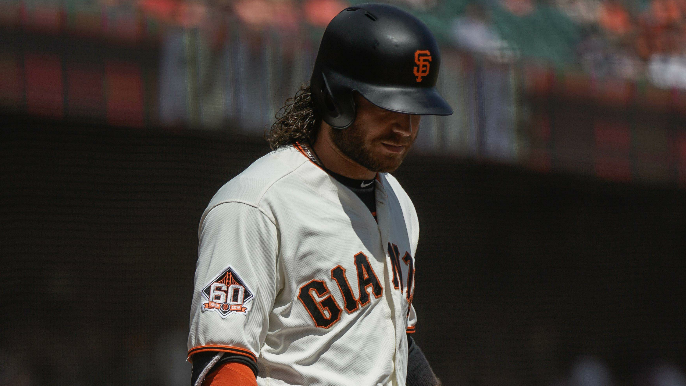 Crawford revealed the issue after Tuesday’s game when speaking to reporters, saying that a nagging left-knee injury has had a significant effect on his hitting. That issue has been far less noticeable, as Crawford has looked like a three-time — perhaps soon to be four-time — Gold Glover at short for most of the season. The knee has apparently improved with the frequent rest Crawford has been receiving from manager Bruce Bochy since the Giants fell out of the National League playoff race. According to the Chronicle, Crawford does not expect to have an operation on the knee this offseason.